This is another within the series of posts which, quite frankly, is not for everyone, not even the intrepid tourist to the left. Truth be told, snails weren’t exactly popular among members of my generation at the old two-flat either. (If you wish to exit, you may do so HERE.) I am probably the only one to have eaten lumache back then and certainly am the only one willing to go back to that well again today. Still, if I’m going to record the family’s recipes for Posterity, I’m not about to start filtering them. Besides, the look on Zia’s face when I unveiled the lumache and announced my plans for dinner was priceless. This blog delights in ways I never dreamt possible! As I recall, lumache, or babbaluci as they are known in Sicily, was not at all a common dish at our dinner table nor, for that matter, at Zia’s. I only remember them being served 2, maybe 3, times. That’s probably because of the amount of work involved in preparing them for the table. They had to be soaked to rouse them from dormancy, scrubbed, boiled, scrubbed again, and either removed from their shells or left intact for further cooking. As you can imagine, this was no 1 day job. Mom would put water, vinegar, and the dormant lumache into her largest pot; place a colander atop the pot, weighted with a heavy book or pan; and, set it aside to let the lumache come out of their shells. As they came to life, they would leave the water and head up into the colander — hence the reason for the weight. Unfortunately, that weight wasn’t heavy enough to prevent me from snatching a pet when I was about 6 years old. It was, however, too heavy for me to replace properly before I returned to bed, my new pet snail in a water glass at my bedside. Mom was just a tad upset when she woke me the next morning. Her kitchen cupboards and counters were covered with lumache on the lam. Even my pet (the little tattle-trail!) was well on its way to my bedroom’s ceiling by that time. Funny thing. I don’t recall ever having a pet snail after that. I’ve chosen to share this recipe today because of Mario Batali. On a recent rebroadcast of Molto Mario, he mentioned that lumache was one of several dishes that the people of Le Marche (the Marchigiani) prepare on All Souls Day. Well, with the Bartolinis being Marchigiani and today being All Soul’s Day, what choice do I have? So, the recipe I’m going to share is the very recipe the Bartolini Girls cooked those many years ago — with 1 exception. There was no way on Earth that I was going to start with dormant lumache. With Max in the house, that is surely a disaster waiting to happen. I can just see him running around my home, trying to lure me into a game of keep-away with some unlucky snail in his mouth, while I’m on a ladder retrieving the rest off of my kitchen’s walls. No, no, no! So, I did a little googling — and it paid off. On Amazon (of course! ), I found canned lumache that were cleaned, shelled, trimmed, and ready for stewing. What was once a multi-day, very messy affair suddenly became as easy as preparing a tomato sauce. I ordered them and, once delivered, I packed them up and brought them to Zia for one most memorable dinner. Heat olive oil in medium-sized sauce pan over med-high heat. Add onions and sauté until translucent, about 5 minutes. Season lightly with salt & pepper. Add garlic and sauté for another minute before adding the tomatoes, wine, marjoram, and parsley. Bring to a boil, reduce to a simmer, and continue cooking for about 45 minutes or until the tomatoes are cooked and the sauce has darkened. Add the lumache with the canning liquid and continue to simmer for about 30 minutes more. The sauce should be dark and thick. Season with salt & pepper, to taste, and serve. * When she cooked lumache in their shells, Mom served them in deep soup bowls with a chunk of crusty bread on the side. When removed from their shells, lumache may, also, be served as a dressing for pasta or atop polenta. 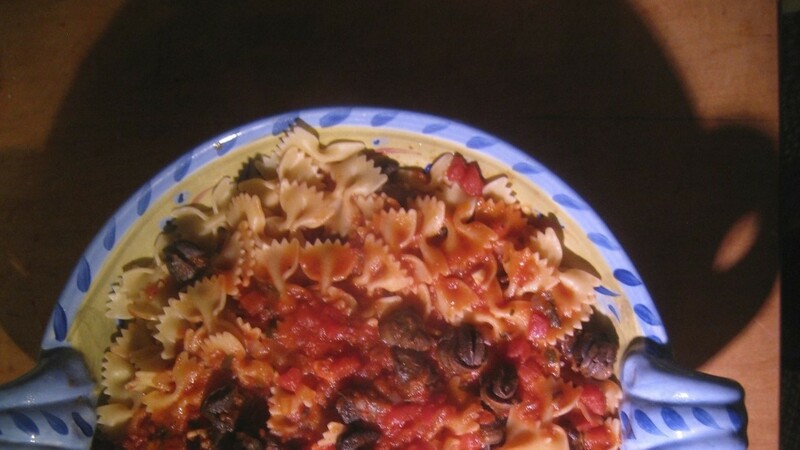 This entry was posted in Family Recipes, Sauce/Gravy (Ragù/Sugo), Seafood (Frutti di Mare), Vegetarian and tagged Cooking, family recipes, Food, Italian, Recipes, Seafood, Snails by ChgoJohn. Bookmark the permalink. Your note made me giggle! I hate to be the bearer of bad tidings, but I don’t think I could cook this. Ritchey would love it – and even though I do love him dearly – one must draw the line! Not to be a party pooper I did try one while we were at a French restaurant – can I say that on an Italian website? Being the proper lady that I am, I didn’t spit it out, although that would have been my preferred choice! Love the Lucy pictures! Not to worry, Phyllis, I’m sure you’re not alone and that there will be more comments from people who agree with you. I’ve known this wouldn’t be a popular dish, although it will be interesting to see how many people come here after googling “lumache.” You can tell Ritchie that if he’s ever in Chi-town to look me up and I’ll fix him a plate. Great post with amazing picture of Lucille Ball – she was brilliant. I love snails and we have very “petit gris” in the Vendee, where they are a local dish along with eels and frogs’ legs. On the Camerahols course, this summer, a couple of clients and myself prepared about 50 of the little critters ( we bought them ready cleaned ) and they were delicious. Thanks, Roger. Years ago, my family also prepared eel and if I can ever find them, I’ll post the recipe. I just don’t see that happening, however. Not being near the ocean, some things just aren’t available. Finding lumache that were canned was heaven-sent. There was no way I was going to clean them. The night we prepared them, Zia and I reminisced during the entire dinner. It really was something special. 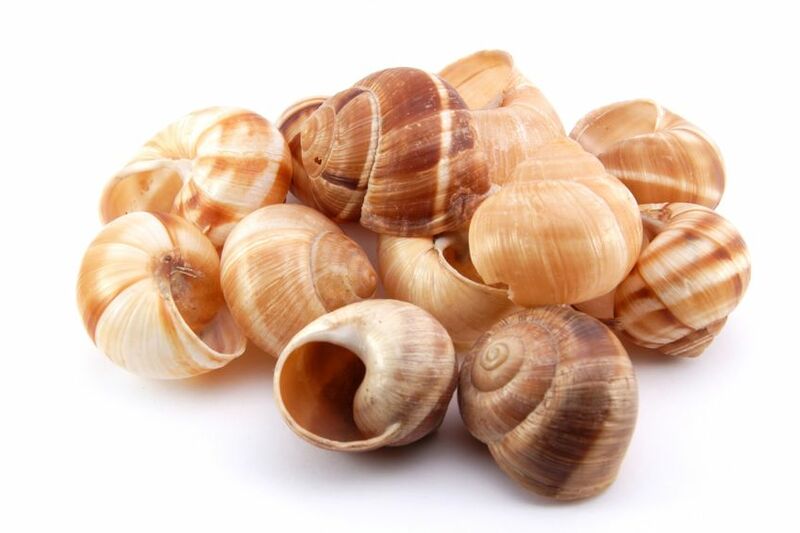 I think you have to be Italian or French to want to eat this, The snail story is great: I can see the escaping snails, trails all over the counter… Did you know we have common garden snails all over the U.S. because someone brought them here to raise them to eat? It’s true. They could have left them in Europe as far as I am concerned. Good for you for presenting all of your family recipes. I cannot speak for the French but I can say that being Italian does not guarantee a love for lumache. My siblings and cousins would never try one, let alone make a meal of them. I’m one of a vanishing breed! Well, I think you probably already know that I am in the “love ´em” camp! We eat them here (in Jerez they serve stewed snails with anis flavours in little glasses with all the broth). You can even buy then squriming around in the supermarket (in the fish section 😉 )and they are often making a bid for freedom too! Well done for keeping the tradition alive – hope Zia enjoyed them. Love the photos – really made me chuckle. PS. My chickens love snails too! I thought you might “love ’em.” When I was in Barcelona, my Traveling Companion and I dined at a restaurant near La Rambla. We spoke very little Spanish and our waiter spoke absolutely no English. We ordered paella and a snail appetizer. We each received a very large bowl of stewed snails and the paella was enough to easily feed 8 people! That was a dozen years ago and the last time I’ve had snails. Now that I can get them canned, however, I’ll be having them more frequently — and I’ll never forget that dinner in Barcelona! Glad you enjoyed the post. My Aunt & I laughed as we traded “lumache stories.” Have a great day! You can save a portion for me next time and I will come and enjoy it with you. Let me know when you’re coming to Chicago, Mandy, and I’ll be sure to serve you a lumache dinner. It would be my pleasure. Have a great day! Love the photos, love the story! Have eaten snails only a time or two, so long as they are loaded with butter and garlic who can complain? To be honest, these favorable reviews are a bit of a surprise. In the past, when I’ve told my snail tales to friends, this is hardly the response I’ve received. They don’t know what they’re missing. 😉 Thanks for stopping by and taking the time to comment. 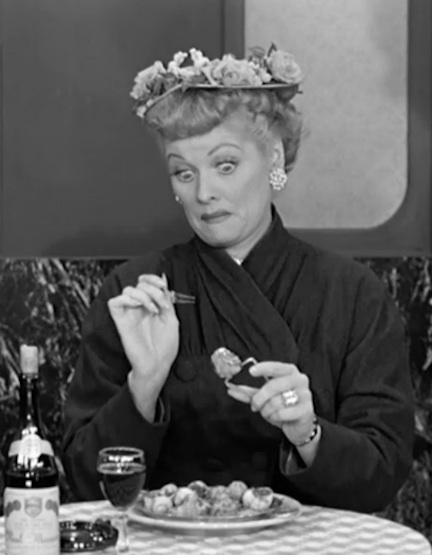 Well, of course I love Lucy, but I can’t say the same for snails. The photo looks good tho! And did your mother give you what for because of this? Cooking something that can crawl away on you….eeeekkk!! I’ve eaten escargot once. Can now cross snails off my list 🙂 Great post. Thanks and, yes, she was not at all happy that morning. Years later, we both laughed about it but neither of us was laughing that morning! That poor woman. It was bad enough that she had to clean the snails — a messy affair — but first, she had to wash down the kitchen! It’s a wonder that she was ever able to laugh about it. Great Family story, and love the snails. I’ve never seen them canned, will have to check it out. Thanks for the laugh! Thanks, David. Learning that snails were now canned and available on Amazon was heaven-sent. They certainly aren’t something that will ever become a regular part of my diet but it is good to know that, with a can on my shelf, I can enjoy lumache if ever I have a taste for them. That just wasn’t possible before. My mother definitely did not make this! While a great cook and baker, she didn’t enjoy getting down and dirty so to speak with her food. Now if this was presented to me for dinner, I would certainly not hesitate one bit to enjoy every mouthful!! Great memories John and another fabulous post! I love the pics of Lucy!! That sounds like something Cecilia would’ve done as a kid! What a great story. The recipe looks just wonderful, as always. I read Cecilia’s stories and think she may be a long, lost sister. She would have easily fit into that two-flat. Thanks for your comments. I was wondering whether your parents or grand-parents ever mentioned lumache or babbaluci. I’d be interested to hear how they prepared them. Does Your John know about this? Not to worry. Your secret’s safe with me, for I will never cross you, that’s for sure. You’d probably fill my car with spiders and I’d have to abandon it, pure an simple. Hey, Nancy, and welcome! I saw that you subscribed and wondered whether you had stumbled upon the blog or were a family friend. You couldn’t be better recommended than to say that you’re a friend of Donna and Ron. I’m glad you enjoyed today’s post and accompanying pictures. Thanks for stopping by and commenting. Don’t be a stranger! what a wonderful post, with great stories. The only times I’ve eaten snails has been in france, and yes they were lovely. Thanks for sharing such a great memory. I’m just hoping I don’t start dreaming tonight of snails climbing the walls tonight! I’ve enjoyed snails in France, too, as well as Spain & Italy. I’m very thankful for parents who encouraged me to try different foods when I was very young. As a result, I’m very willing to try new dishes and have enjoyed some wonderful meals. For my Mom, the nightmare wasn’t snails on the walls. It was the clean-up afterward. Yuck! Those pictures of Lucille Ball are priceless. Truthfully, my reaction would probably be the same! I wouldn’t consider my palette very adventurous. Though snails freak me out, your recipe does sound pretty dang delicious. Good move on ordering the snails already prepared. I agree, wouldn’t want them crawling up your kitchen walls! I clicked on the “click here” and ended up in a fantasy land of pools of cream and sweets waiting to cause cardiac arrest. Are you trying to kill people? Joking aside…can’t say that I’ve indulged in snails before, but I’m game for anything you post. Thanks for sharing my friend! Yes, that’s Lucy and, believe me, I would never buy living snails to be cleaned before eating, nor would I ask Zia to do so. The lumache recipe was going to be “lost” until I found canned snails, already prepared, online. Zia & I were talking as we made that pasta in the picture. That was the first time the lumache recipe was cooked in about 50 years! And that’s because no one would clean them. Who would blame them? “The Matriarch” sounds like a perfectly lovely woman with good taste, no doubt. Bring her with you next Spring and I shall have a snail feast prepared in her honour. You can park Daisy in the garage. My car will be sealed & parked elsewhere, out of harm’s way, so to speak. Oh, my! I’ve had LOTS of snails in France, but never any other kind of preparation…I always wondered what they did with them in other countries, if anything… This looks great – can you tell I’m in the ‘love em’ camp? I’m kinda surprised you had to go to Amazon for them, though…I can buy them in the grocery store around here. You’ve got to be kidding me! In the grocery stores? I almost did a “spit-take” on my monitor when I read that. I find it really funny that after so many years and going through the trouble of ordering them via Amazon, my grocer has had them on the shelf the entire time. I’m definitely going to check that out. And I’ll have a good laugh if I find them there, right next to the Chicken of the Sea. I’ll definitely let you know. Thank you! The specialty foods manager of the store where I worked for 10 years always had them on the shelf…they’re French, but not seasoned. He had seperate containers of shells, too… It wasn’t a fancy store, either – just a locally owned grocery. I’ve seen, and purchased, frozen l’escargot but I never thought to check to see if they had canned snails. Rest assured. If there is a can of snails for sale in Chi-town, I’m going to find it! Those look amazing granted at first I was a little iffy but I would seriously try these. I remember when I was in Junior High (yes that long ago before it was called Middle School) my Dad was on a business trip to France while he was there tried escargot and liked it, how could you not like something dripping in butter and garlic. Hmm I wonder if I can find these at Whole Foods they have whole Octopus. Great post really enjoyed it. I think most object to the idea of eating snails and I certainly don’t blame them. I will not eat insects. Eating snails prepared as the French do, with all of that garlic butter, is a good way to get past the hesitancy. A previous commenter said that her local grocery has canned snails, which is completely new to me. I’m definitely going to check Whole Foods and another local grocery, Treasure Island. Failing those 2, I’m heading to a couple ethnic markets that I frequent. If there’s a can of snails for sale in Chi-town, I’m gonna find it! Enjoyed reading all about lumache and your childhood pet but won’t be attempting to cook or eat them. I am sure it is because they weren’t part of family’s table or some mental image in my brain. The one time I tasted snails was in France in a restaurant and my memory is garlic and butter and a timid chew of the actual creature. I should not admit my limited, unadventurous palate but I liked reading your post a lot and your family stories and memories. 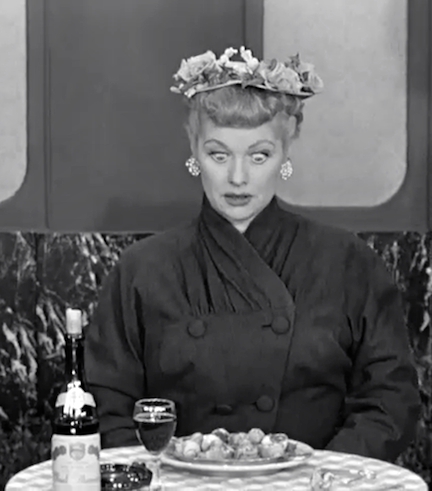 The Lucy photos are wonderful accompaniment. Admittedly, Ruth, snails are “out there” as far as edible food is concerned. Food is such a personal thing and, whatever the reason, we either like something or we don’t. At least you were game enough to try snails. There are some foods that you couldn’t pay me enough to try. Hi John, I’m in the love’em camp amd have eaten them so many ways but not with pasta…sounds great. I’m sure that you will be able to find canned snails in Chicago. I bet you can find those ells if you make a few calls. When we lived in Miami we bought them at a local Italian market. I had wiggling ells in the bottom drawer of my refrigerator for two days before my husband roasted them with potatoes and bay leaves for a Christmas eve seven fish meal. I love this post. I had a good laugh picturing the snails having escaped out of their pot and clutched to your mom’s ceiling. I also can appreciate that a dog and a live snail don’t mix well if you want the snail later for dinner. I actually like Escargot, but truthfully it’s probably more the garlic and butter that I like as opposed to the actual snail itself. This sounds interesting to say the least and I would consider ordering them at an authentic restaurant if I saw it on the menu, but don’t think I have the gumption to make it myself. Good call on the canned ones though. Thanks, Geni, and I agree about l’escargot. The garlic butter makes the dish, no doubt about it. FInding them canned was a lucky stroke, that’s for sure. Learning from our blogging buddies that they may be available in local grocery stores was an absolute revelation! This is my quest: to find canned snails in Chicago! Heard that thunder, John. Interestingly enough, we passed by a street food vendor in a souk in Marrakech last night cooking a huge batch of snails. Yes, street food! Not sure I would give it a try here , but your version can sure scare up a watering mouth on my end (and I’m still stuffed from dinner! )I love escargot, French style with garlic and butter! Thanks for the pics of Lucy! My first cousin is named after her! Thanks, Eva, for spending valuable vacation time to come here and comment. I can only imagine how your mum felt when she came into her kitchen to find it invaded by snails! I’m glad you enjoyed the post, Sawsan. It is a favorite tale within my family and all of us have a “snail tale” to tell. You’re very wise to deny your children pet snails. They don’t do anything but eat and, sooner or later, they are going to escape. They aren’t as easy to find as one might imagine. Birds, on the other hand, make fine pets for children. I had them when I was young, too. Have a great day! I have tried escargot in the past and though I haven’t sought any out since, I don’t remember them as being bad, actually mostly chewy and garlic-y in that preparation. I used to see them in specialty stores here all the time, but not so much any more. 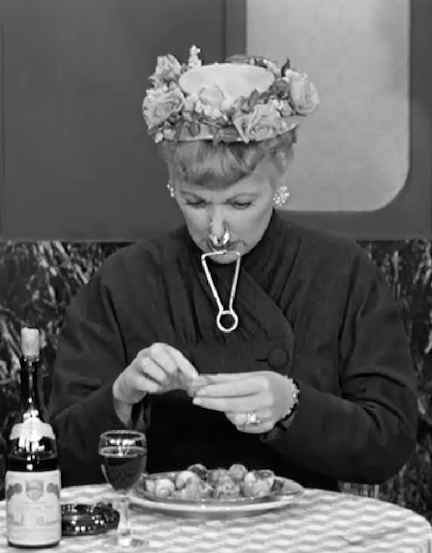 I love the memory of the I Love Lucy episode with the snails…makes me laugh out loud to see the images, and the lumache on the lamb story is priceless! Maybe, just maybe, because of your story, I will give them another try the next time I see them on a menu. A fun post! Oops, lumache on the lam…though I wonder, what would lumache on lamb be like? Now that’s funny! Thanks for helping to end my day with a laugh! Fun dish! I’ve heard of this, but never had it. And although I’ve had snails before (classical French preparation with garlic butter), I’ve never even thought of cooking with them. Good to know I can get them canned so I don’t have to deal with the messiness of prepping them. Love this recipe – thanks. Hi, John. Once again I have commented too late and must scroll through hundreds of adoring Bartolini Kitchen fans’ comments. Hehe. 🙂 This recipe is just beautiful and really strikes a chord. Apple cake is my favorite Rosh Hashanah dessert! Yours has golden raisins (the gateway raisin for those who dislike raisins! ), extravagant black walnuts and a decadent salted caramel. WOW. I also don’t like overly sweet desserts. Even with the caramel, I know this won’t be too sweet thanks to your smart addition of salt! I am sure glad that Zia Mariolla shared this recipe with your ZIa. And I loved reading about your coffee conversation, too. So sweet. Enjoy your trip to Michigan and travel safely. Thank you for sharing your scrumptious and fairly easy recipe! I can’t wait to make it – it is apple season, after all. Sorry, John! I was reading your apple cake entry – then this entry – and put a comment on the wrong page. OOPS. HA – yes, at least I was on the right blog. That is a good point – and a very positive way of looking at my error. 🙂 For some reason, this cake has literally been haunting me – something about your photo – MMMMMMMMMM. Anyway, we plan on making this several times over the Fall and winter. The caramel with salt is quite gourmet; it elevates the recipe for sure. Have a great week! Thank you! I enjoy snails wherever I’ve tried them, in Paris, Barcelona, and my Mom’s table. I must admit, though, that it is hard to beat snails made with garlic and butter. C’est magnifique! Loved this post, John…I love when your humor shines through! I do like snails…though I’ve never prepared them myself. My first taste came from the Pontchartrain Wine Cellars restaurant in the ’80s. Do you remember that restaurant downtown Detroit? Now that was fine dining! Thanks to using the canned variety of lumache, this appears to be a “must-try” recipe! Love the simple ingredients, that I’m sure create spectacular flavors. Thanks for linking this in your current post! I’m too far removed to know of a Detroit market where you can purchase canned snails but you can find them on Amazon. Trust me. This is so much better than trying to clean them. So much better! SO happy to provide your virtual trip, John. 😀 I hope my next Michigan Monday post (two weeks away) will provide another…does Buddy’s pizza spark any memories? As for the snails, we do have a few Italian markets in the suburbs… I’m sure their large variety of imported products can provide just what I’m looking for! I remember Cloverleaf! I was raised on the east-side, as I recall it was in East Detroit (now called Eastpointe!). As much as I love traditional Neapolitan style pizza, there’s nothing like the thick, Sicilian style with it’s crispy crust once in awhile either! The East Side?!?!?! The old two flat was near Chalmers and Outer Drive. Are you at all familiar? Sure am… though my familiarities lie more in the Gratiot corridor. I was raised in Fraser, though both of my parents worked downtown, my sister born at Saratoga and of course, many trips on the bus to the old Hudson’s! DeLaSalle has relocated in the suburbs, in the general area of my old stomping grounds, Warren. My in-laws both went to Pershing and my husband went to Detroit Redford. Redford High is now a Meijer and I think Pershing is gone too. Unfortunately, the city airport area is pretty run down these days…so sad to see. Unfortunately I’ve never had the opportunity of eating Lumache. What a shame. After dissecting several disgusting looking snails in a biology lab during my college days…my era of the snail ended. I’m glad it involves so much work so that means I shall just say pass and move on. However, I’ve enjoyed the look on Lucy’s face and her feeble attempt to eat the snail. Have a great day, John.